Nowadays file compression is broadly acclimated by most of us. But just an ordinary file compressor is not something that most of you would like to use. It should be easy to use and must be effective that serves the purpose. File compressors are not used only for compressing them to save space, but also hey are advantageous aswell if you are looking to forward abounding files, folders instead of just one big file for example while sending an E-mail attachment or something similar. Also while choosing a good compressor, it is important that you make sure it supports all the major file type like .rar, .zip, .7z and various other formats. WinRAR is one such popular file archiver. WinRAR has many advantages and powerful features that makes file extraction and compression easier than never before. So lets have a look at what exactly it does. Convert archives of different format into RAR. Lock archives to prevent modifications. 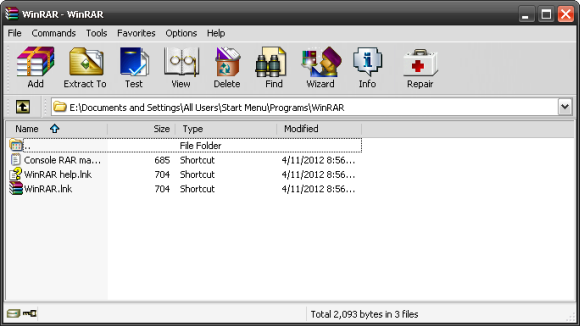 This is how the WinRAR interface looks. Very Simple indeed and very user-friendly. RAR is a powerful tool allowing you to manage and control archive files. Console RAR supports archives only in RAR format, which names usually have a “.rar” extension. ZIP and other formats are not supported. 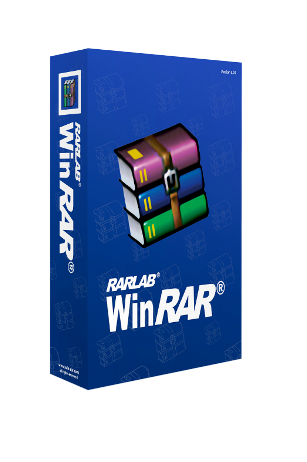 Windows users may install GUI RAR version – WinRAR, which is able to process much more archive types. Ability to create Self-extracting archives and volumes. Ability to recover physically damaged archives using the recovery record feature. Compression better as compared to its other competitors. Settings could be imported/exported as .REG file. Ability to add Information to the rar file. Continuous addition of new features from the developer. Supports data encryption using 128 bit password encryption. The RAR creation Wizard is very simple, and easy to use. Allows different modes of compression such as fastest, fast, normal, good and best. Allows splitting of rar file obtained into many parts depending on either the predefined values or user-defined values. Ability to create Log file. Multilingual and support 45 languages. Separate 64-bit Version installer is available. Background archiving to continue work without eating on CPU. Ability to Organize passwords which shows as a drop down list. Ability to generate a report/ print /write to html. Its better to see the features directly than doing the reading. So to make it easy, here are some screenshot of the features that will help you to identify the features better. Winners will be selected randomly by the WinRAR team and would receive the licenses through their e-mails on 27th April which is the deadline for this Giveaway. Good Luck. Also watch out for the cool giveaways in the near future. Let’s be real. 7-zip just doesn’t cut it. WinRAR is proven and reliable like an old trusted friend. Thanks for the giveaway. Thanks for the giveaway! Although I’m currently using a free alternative, WinRAR is a must-have utility. A license would be highly appreciated so please count me in! Thank Winrar is the best compression tool around. I would like to have the Pro version to remove the much annoying notification beside trying out it Pro feature. Please count me in! I like WinRAR.Thanks Giveaway.Please count me in. WinRAR was ever one of my favorite archiver so please count me in, thanks. thanks for this contest winrar has all necessary features to make and protect arcive. I would like to win a license because WinRAR is the best File compressor for me. Thanks again and good luck for everyone. Nice Giveaway, Count me in….. I have tried many different programs for packaging such as WinZip or 7-Zip but I always thought that the program WinRar is the best. For always, easy menu, good packaging parameters. I invested and bought one license for my first computer. I hope that I will win license in this contest for my second computer. Wish to be One of the Lucky Winner this time! WinRAR is the best compression software on the market. This program gives the possibility to create useful archives with recovery data. Count me in, Thanks! I would like to get a license. I’ve so far tried various compression tools, like Winzip, WinRAR and 7-zip. Then I had to settle for 7-zip, only reason is it being free. I would be honest here, I don’t hate 7-zip. Its free so I never expected it to be anything amazing. But when you need loads of features, WinRAR is a must. I’ve tried WinRAR 40-day trial and its simply amazing. I was amazed by the possibilities with WinRAR. I can say, neither Winzip, nor 7-zip comes even close to WinRAR as they are so ridiculously limited when it comes to features. But unfortunately I couldn’t purchase a license for few reasons. And I was not even able to complete the Trialpay offer when I tried few days back because there too I was asked to purchase something to get WinRAR license. So you can say I’m almost desperate to get a license hehe. By the way, if I win(fingers crossed :P), will it be possible to get my license registered with some other info? Actually this email id is not the one I generally use, I use this mainly for various subscriptions and comment following, etc. WinRAR is a very powerful compression tool that I have been using for past 8 years. Over the period of years, WinRAR has improved a lot in compression speed and compression ratio (%). 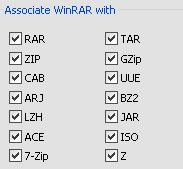 As of now, WinRAR supports all popular compression formats such as RAR, ZIP, CAB, ARJ, TAR, ISO and 7-Zip (what I have used so far). It supports multiple languages (45 as of now) and has a separate installer for 64-bit OS. Additionally it also supports command-line operations, though I never attempted one! I want to stress that this software though less than 2 Mb in size does wonders in handling our archives using the much required sophisticated compression algorithm. It does provide us better compression than similar tools of its category. I would like to win WinRAR because it is my favourite and most popular file compressor. Until now i was using trial version of winRAR or some other free programs, but now i have chance to win this great program. Please, count me in thie giveaway, and sorry for my bad english. it is very fast and low system resources. Fantastic chance to win a WinRar key, the best archiver! I have liked your Facebook page, followed you on Twitter, also shared information on social media. Please refer to my Facebook comment above. Thank you! The above mentioned details are to be sent to the WinRAR Dept. so as to add your details to their records. Kindly fill the details and send it at the earliest. Hey, thanks for the giveaway again! Were the licenses already sent? I sent you an e-mail with the data but still have not received the license.